PLOT SUMMARY: Michael is about to face his worst nightmare: being an atheist in a strict Catholic school. Fortunately, he won't be alone in his struggles, because on his first day, he meets Lucy. Lucy is a devout Catholic, but she has issues of her own with the Church; specifically, the way it treats women, and that she'll never be able to fulfill her dream of becoming a priest. Upon finding out about Michael's discomfort at the school, she invites him to join Heretics Anonymous, a secret club for students who don't fit in, for one reason or another. What begins as simply airing their grievances in private turns into a campaign to change the school for the better, one prank at a time. But what happens when things go too far? FIRST THOUGHTS: This is one of those books that I knew I had to read, just based on the title. Fortunately, it didn't disappoint; in fact, it exceeded my expectations. Having had an extremely mixed experience with religion myself, I found many parts of this novel to be extremely relateable. This reminds me a lot of the works of Adam Selzer, an author I've mentioned my love for elsewhere on this website. While I went in expecting this to be more of an ensemble piece than it was, this is an incredibly enjoyable comedy, with a great cast of characters to back it up. I can very easily see this becoming a young adult mainstay in the future. Regardless of your religion or lack thereof, give this book a try. I think you'll enjoy it. THOUGHTS ON PLOT: I really loved the initial setup of this book -- a Breakfast Club-style group of students who, despite their contrasting personalities, band together to take down a school that's against them. The first half of this book was excellent, with Heretics Anonymous' pranks and rebellion against the administration. Really, the book is worth reading just for that first half. While the second half isn't bad, it is a bit of a letdown compared to the first part's hijinks. I can't say where the turning point is, exactly, due to spoilers, but you'll know it when you get there. However, the story is incredibly entertaining and funny throughout, even if I enjoyed the buildup more than the conclusion. THOUGHTS ON CHARACTERS: At first, I wasn't so sure I'd like Michael, but he wound up being a pleasant surprise. Yeah, he can be a self-involved tool sometimes, but no more than any other teenager, and he's got a lot of compassion and wit that makes him very likable as a main character. I also loved all the other Heretics, though I felt like Eden and Max were woefully underused compared to Lucy, Avi, and Michael. I had a similar complaint about the book's pseudo-antagonist, Theresa. Theresa's mostly there to harass and annoy our protagonists, and while she does a good job at that, what little we know of her backstory pointed to her having some sympathetic qualities, and possibly needing a group like Heretics Anonymous herself. However, she doesn't get developed, and she doesn't change at all throughout the story, which is a real disappointment, since I think there were plenty of opportunities to give her depth. Overall, while the lead characters were well-written and very developed, I would've liked to see more done with the side characters. THOUGHTS ON WRITING STYLE: This, like a lot of contemporary YA, is written in first person, and it follows the increasing trend of writing in the present tense. I thought that the author captured Michael's voice really well, and she did a really good job at creating a different "voice" for each Heretic, and most of the minor characters, as well. Overall, this book is incredibly easy to read, moving at a fast pace. I got through it in one sitting, and I'm sure several other readers will do the same. THOUGHTS ON POLITICAL STUFF: The author has described herself as having a "complicated religious background," and it shows. 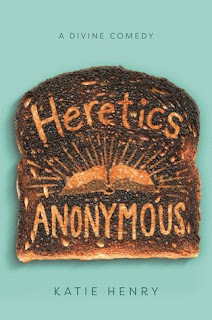 However, I think the religious aspect of Heretics Anonymous is handled extremely well. One of my pet peeves is when atheists and agnostics are treated as inherently smarter than theists; I'm agnostic myself, and I know firsthand that that just isn't true. I liked that this book treated religion -- all religion -- and atheism with the same amount of respect. Jokes are made about religions, sure, but never at the expense of those that believe in it. There's also a nice amount of POC and queer people in the cast, although the protagonist is straight and white. One of the characters is also heavily coded as autistic; at least, that's how I read him. I wish that had been explored more in-depth, especially in how that would make him feel out of place at the school. FINAL THOUGHTS: This is a wildly funny, heartwarming story about five misfits that's almost guaranteed to brighten your day. 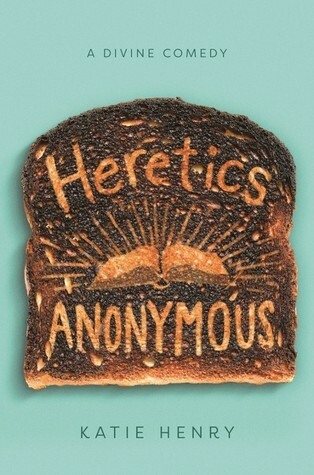 Regardless of your religious leanings and background, there's a little something for everyone in Heretics Anonymous. So, count me among the raving advance reviews for this book, and be sure to check it out once it hits the shelves. If you've read Heretics Anonymous, I'd love to hear your thoughts in the comments below! And if you haven't read it yet, do you plan to once it's for sale?